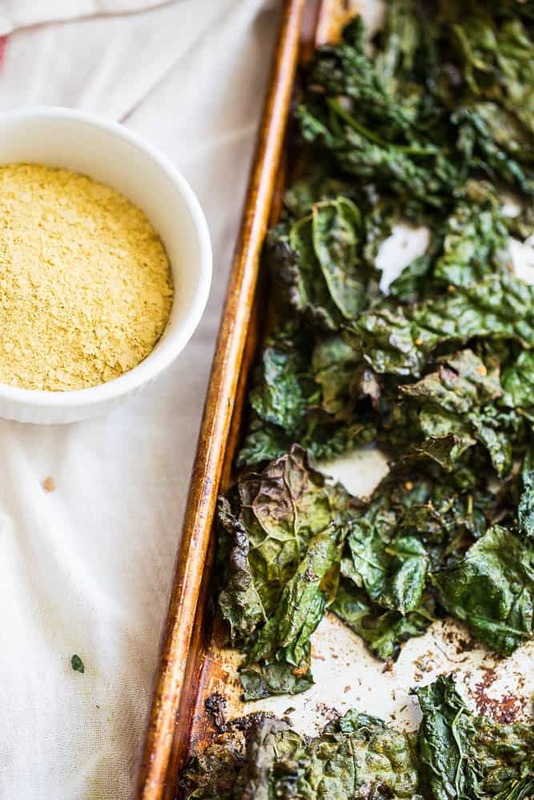 Kale chips are soooo 2012. I tried making them in 2012 and thought they were bitter and weird. What was all the hype? Were kale chips just a weird hipster thing that everyone pretended to like but no one actually liked them? A few years ago I grilled kale for my Chimichurri Steak and Potato Salad with Grilled Kale, and mixed up with that cilantro dressing, those crispy greens were actually pretty tasty. 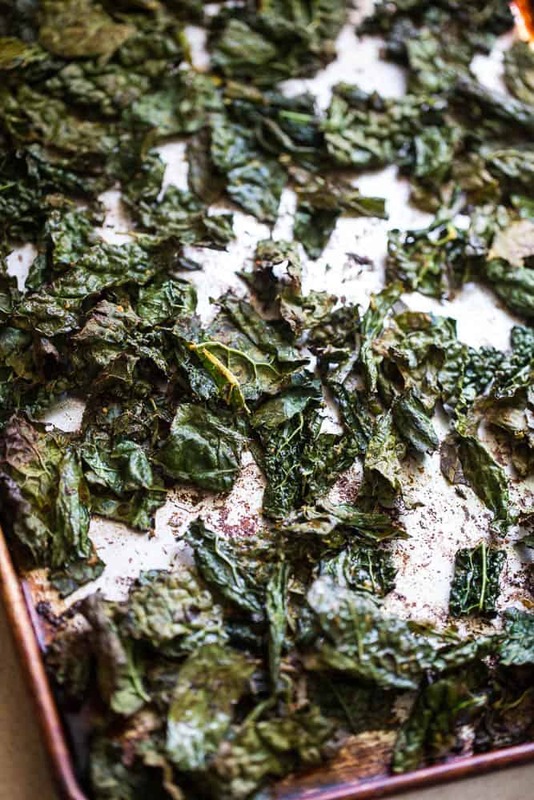 I didn’t give kale chips another thought until a few weeks ago when a friend suggested I make ranch kale chips with my Paleo Dry Ranch Seasoning. I figured it was worth a try, I mean I love that ranch seasoning a lot. She also suggested putting nutritional yeast on them to give them a “cheesy” flavor. Or was that my idea? 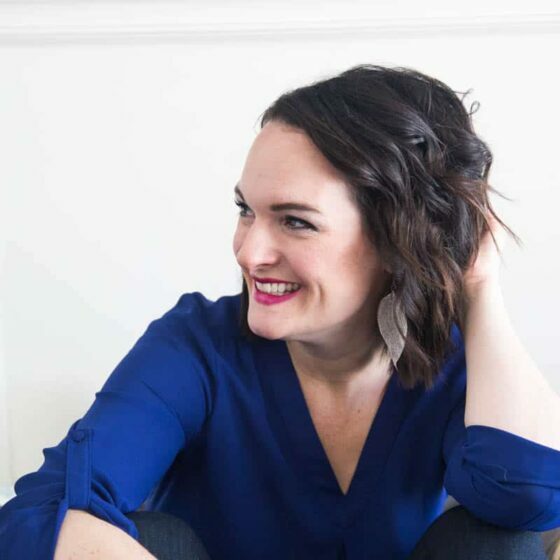 (Do you remember, Kristi?) Anyhow, after our conversation I felt like tackling kale chips again. I made a trip to the farmer’s market and picked up a couple bunches of kale from my friend Elizabeth who runs a local farm. You can use lacinato/dinosaur kale like these or you can use the curly kind. The seasoning that goes on this is really simple and only a few ingredients. To solve the bitterness problem, I remembered a technique I learned to help reduce bitterness in kale when making a salad — you massage the kale with some acid and a little oil. 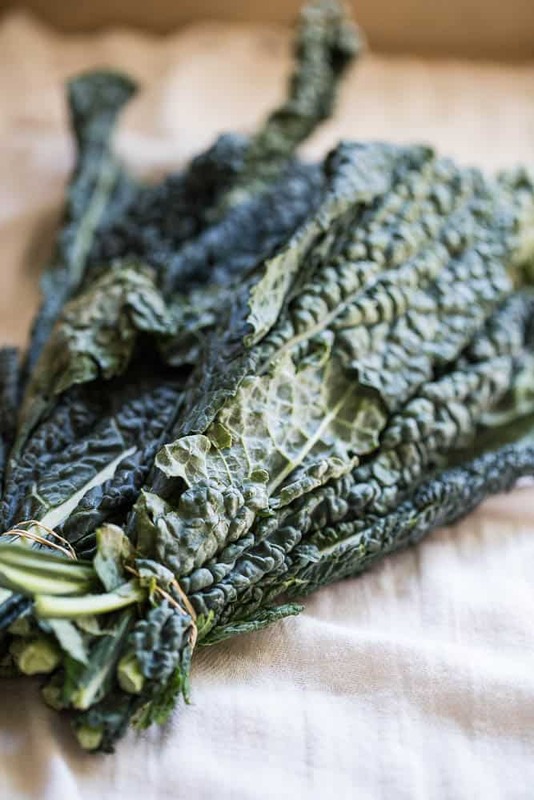 I massaged kale in these recipes, too: Massaged Kale Salad, Kale Salad with Roasted Butternut Squash and Apples, and Kale Caesar Salad with Garlic Shrimp & Prosciutto. Have you tried any of those salads? They’re all pretty amazing. I never thought I’d EVER eat raw kale, but rubbing lemon juice on those leaves calms that bitterness right down. It’s magical. One thing.. I noticed that the curly kale crisps up better than the dino kale, but after the dino kale chips sat out for a while (*cough* overnight on the counter) the softer kale chips had crisped up, too. What’s nutritional yeast? It’s deactivated, dried yeast. 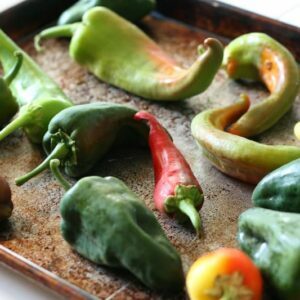 It has a “cheesy” kind of flavor, and it’s great to use in paleo, vegan, or other dairy-free recipes where you need to add a little savory flavor and cheese is off limits. 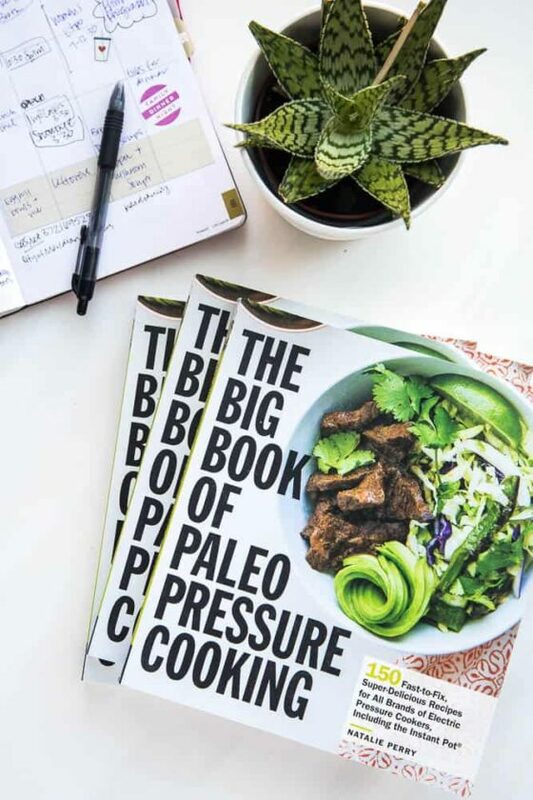 I actually used it quite a bit in my cookbook, The Big Book of Paleo Slow Cooking. 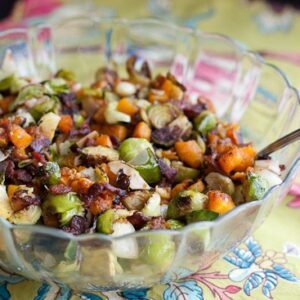 It sort of looks like fish food, but don’t let that scare you off. I buy mine at a grocery store with a large bulk section, but you can also find it at health food stores, on Amazon, and even at Trader Joe’s now! If you've never liked kale chips, I urge you to try these. 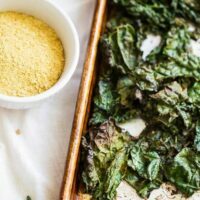 Massaging lemon juice into the kale takes away the bitterness, and the ranch seasoning + nutritional yeast is a delicious combination! Tear the kale leaves from the stems and chop or rip the leave into smaller, "chip-sized" pieces. Discard the stems. 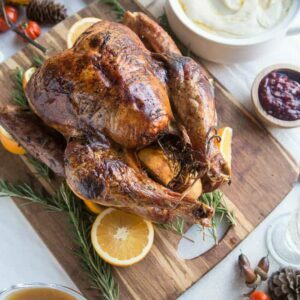 Spread the leaves out on a rimmed baking sheet. 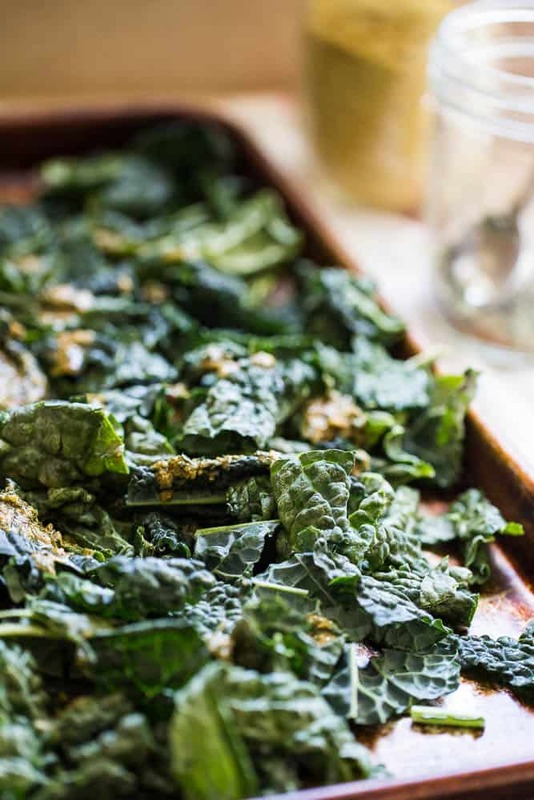 Combine the rest of the ingredients in a small bowl, then drizzle it over the kale. Use your hands to spread and massage the seasoning mixture into the kale leaves, for about 1 minute. Spread the kale out evenly on the pan again and bake for 12-14 minutes until the kale begins to turn golden brown and most of the chips are crispy. They'll continue to crisp as they cool and sit for a while. Allow them to cool on the baking sheet instead of dumping them, hot, into a serving bowl. They'll crisp up better this way. I think this might be my 15 minutes of fame. Squee! I hope you get a better 15 minutes than this. I think it all comes down to seasoning. I want to try this! I agree! And massaging the kale for a minute or so before baking helps a lot, too, I think.